That brings proceedings in the Siambr to a close. Senedd Live returns on Tuesday 12 March. The topic chosen by John Griffiths (Newport East) for the Short Debate is "The Gwent Levels: a unique and historic landscape". He commends the work of Living Levels which "aims to reconnect people and communities to the Gwent Levels landscape and provide a sustainable future for this historic and unique area". The Welsh Government is proposing building a road between Magor and Castleton, which would include a bridge across the River Usk, as well as major remodelling of junctions 23 and 29 of the M4. Hundreds of people attended a demonstration outside the Senedd in December to oppose the road. Conservationists say it would be a "direct attack" on "Wales' own Amazon rainforest", the Gwent Levels. Health Minister Vaughan Gething says the routine use of multiparametric MRI before prostate biopsy is not currently recommended by the National Institute for Health and Care Excellence (NICE), and that the relevant guideline is under review and health boards are working together to prepare for potential changes to the investigation of suspected prostate cancer. Prostate cancer overtook breast cancer as the third biggest cancer killer in the UK, according to recent figures. The scan is only available in the Cardiff and Vale, Aneurin Bevan and Cwm Taf health boards. Patients in some parts of north Wales have to pay £900 for a prostate cancer-detecting scan, campaigners said. Stuart Davies, from Llangollen, paid for a scan after prostate cancer that he beat nine years ago returned. "It turned out I didn't need the scan, which started us off on this journey," Mr Davies said. "I found out that scans are free in some places in south Wales and not in north Wales. "I am aware that there are people who are waiting for these scans and can't pay for them. It is a postcode lottery." Petitioner Stuart Davies claimed access to the scan was a "postcode lottery"Image caption: Petitioner Stuart Davies claimed access to the scan was a "postcode lottery"
Petitions Committee chair David J. Rowlands (South Wales East) presents the petition which calls on the assembly to "urge the Welsh Government to act now and make high-quality, multi-parametric MRI (mpMRI) before biopsy scans available to all eligible men across Wales who have a suspicion of prostate cancer". The next debate is on a petition calling for a prostate cancer-detecting scan to be free across the country. Campaigners said patients in north Wales did not have free access to pre-biopsy multiparametric MRI scans (mpMRI) unlike patients in south Wales. The petition containing over 6,000 signatures was handed to the petitions committee in December. The Plaid Cymru proposal that the National Asssembly for Wales "believes that there needs to be a substantial increase in the scale of building social housing in Wales" is passed without objection. Julie James, Minister for Housing and Local Government, says "we know there is an urgent need for homes for social rent across Wales". She reiterates the target of delivering an additional 20,000 affordable homes this assembly term. Conservative David Melding says "we do need to talk about scale, and building many, many more social homes and homes in general". He adds, "my broad assessment is that we need 40% non-market homes and 60% market". Leanne Wood says "between 1997 and 2007, just 825 new units of social housing were built each year, and that only increases to 850 each year in the last 10 years. "But the Public Policy Institute for Wales estimate that we need between 3,300 and 4,200 additional units of social housing every year, yet just 850 homes when we need over 4,000. "That gap is absolutely staggering." The topic chosen for the Plaid Cymru debate is building social housing in Wales. The party proposes that the National Assembly for Wales "believes that there needs to be a substantial increase in the scale of building social housing in Wales". Unusually, no amendments have been tabled. 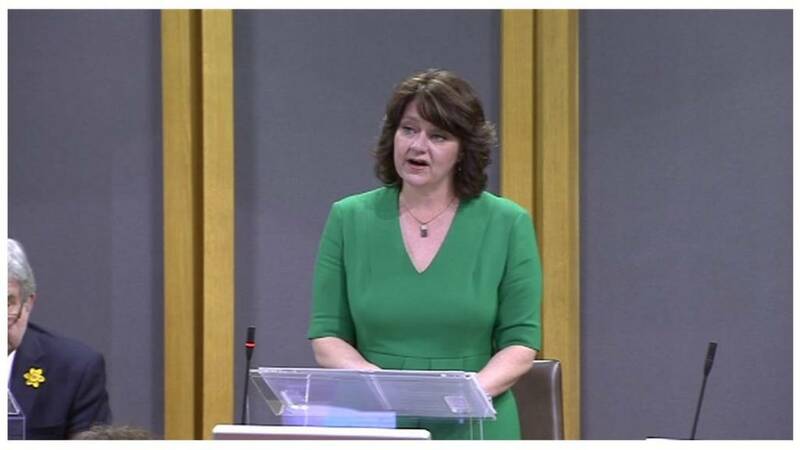 Minister for International Relations and Welsh Language Eluned Morgan says Brexit and devolution sets out proposals for more co-operation between devolved administrations and the UK government when we leave the EU. The chair of the Constitutional and Legislative Affairs Committee Mick Antoniw (Pontypridd) presents the report. He explains this Agreement is "intended to support the National Assembly’s capacity to scrutinise Welsh Government activity and to hold Welsh Ministers to account in the intergovernmental arena only." The first debate of the day is on the Constitutional and Legislative Affairs Committee report: Inter-Institutional relations agreement between the National Assembly for Wales and the Welsh Government. Respect for, and recognition of, the part confidential discussions play between governments, particularly when developing policy. Dafydd Elis-Thomas says the Welsh Government has "no intention at all of being involved directly" in the current discussions about reorganising Welsh rugby. Andrew RT Davies (South Wales Central) asks what discussions has the Welsh Government had with the Welsh Rugby Union in light of reports of a major overhaul of the professional game in Wales? Mr Davies says many fans were “punch drunk” by the proposals. As part of 'Project Reset' the rival Ospreys and Scarlets regions were expected to merge, with a new team created in the north of Wales. But in the latest twist to plans to reorganise professional rugby in Wales, the Scarlets say the proposed merger with Ospreys is "off the table". Yesterday Mr Davies told AMs that the Assembly rugby team had a "stonking win" against the Houses of Commons and Lords two weeks ago—46-14. The next item is Questions to the Assembly Commission, the body responsible for the day-to-day running of the National Assembly for Wales. Plaid Cymru's Dai Lloyd asks what assessment has the Commission made of the impact of political defections on democratic engagement. The Llywydd Elin Jones says no such assessment has been made. During this assembly term, Lord Elis-Thomas and Caroline Jones have left Plaid Cymru and UKIP respectively to become independent AMs, and Mark Reckless left UKIP to sit with the Conservative group. UKIP's Gareth Bennett asks whether there are ways the National Library of Wales "can mitigate the problem of communities losing their local library". Eluned Morgan says "it's a real tragedy that we are losing so many of our libraries around Wales", and blames UK government "austerity". Dafydd Elis-Thomas, Deputy Minister for Culture, Sport and Tourism, also tells Delyth Jewell, "I don't think the system we have of regulating broadcasting works for the benefit of Welsh broadcasting". Ms Jewell had criticised the drama Pitching In and Global media's announcement it will launch UK-wide national breakfast shows on Capital, Heart and Smooth radio.